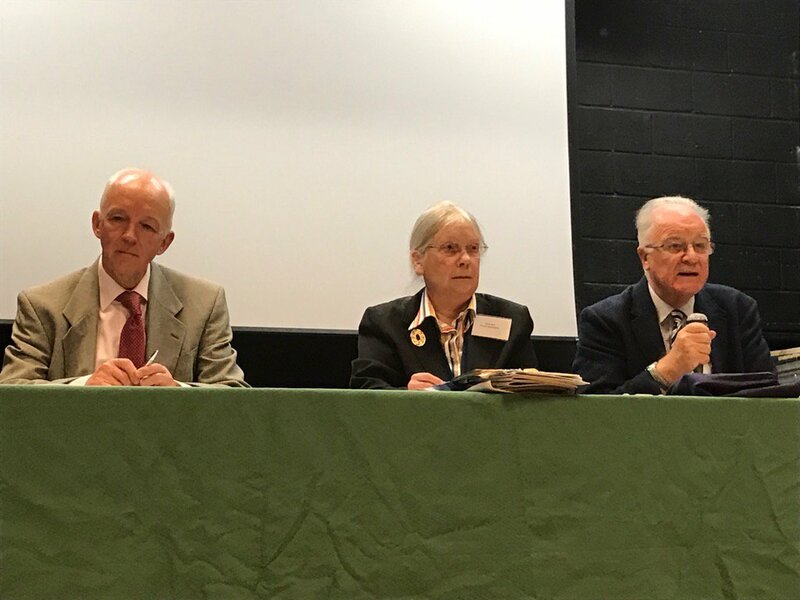 The 85th AGM of The Pinner Association, held on 26th April 2017 was attended by some 90 to 100 local residents. Greater detail will be available in the next copy of “The Villager”. The guest speaker was Dr. Amol Kelshiker, Chair of the Harrow Clinical Commissioning Group. In his most interesting presentation he explained the work of this Group, which involves all GP surgeries in the area, and the challenges it faces in providing the best possible level of primary care to all members of the community. With very high levels of diabetes, obesity (especially of children), a great many over-80s and under-5s, and decreasing numbers of available GPs it is necessary to find solutions for patients using traditional and “innovative” methods. The Group is, however, fortunate to have available the resources of Northwick Park Hospital, a recognized centre of excellence, and is also committed to trying to implement a policy of prevention rather than cure. Dr. Kelshiker’s presentation was followed by the AGM itself when Robin Youle was elected as President and Christine Wallace as Chairman; the Vice-Chairman’s position remaining unfilled; with the other Officers and the Committee being unanimously elected/re-elected. 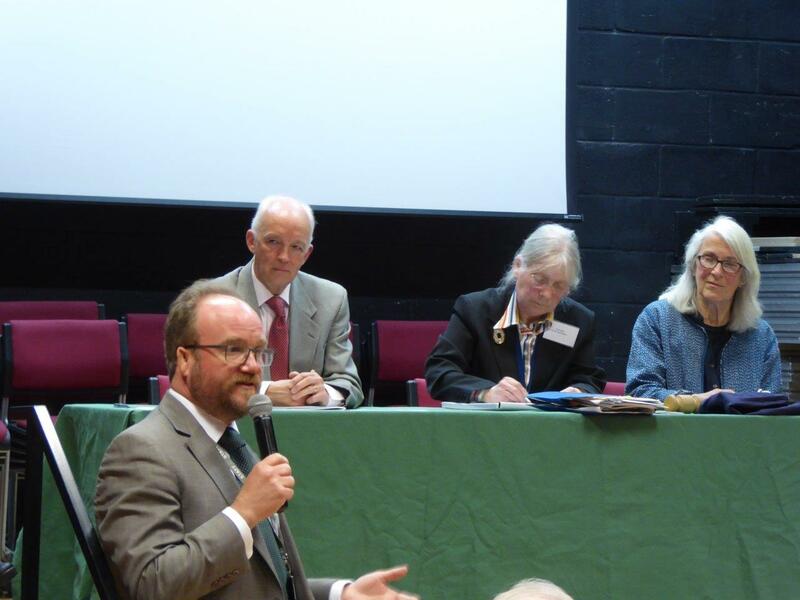 The Open Forum that took place after the AGM led to some lively questioning from the floor. The first question naturally covered the burning issue of the day : the future of Pinner Wood School. Mr. Daniel Lester, Head of Communications at Harrow Council, was present to explain the current situation and future plans so far as they have been able to be formulated in what is a very uncertain situation. Insofar as the summer term is concerned Keystages 1 and 2 have been appropriately, though temporarily resited at the Civic Centre and Whitefriars School respectively, with the setting-up of appropriate transport facilities, but for the new school year nothing is yet certain. If safety can be assured it may be possible to install a “pop-up” school on the existing playing fields of the school but this is still an unknown. Twenty possible locations for a one-site solution to house the school for the start of the autumn term are under consideration, and Harrow Council will announce their decision at the end of May. What is certain is that the cost of managing this problem will run to millions of pounds and it is hoped that various government funds will be available to pay for this. Mr. Lester praised the incredibly helpful attitude and support of all local schools and of the local population. Other questions raised concerned Pinner Memorial Park and the availability of its resources to all members of the public and the need to set up a Park Users’ Group; traffic problems at the Bridge Street – Love Lane roundabout; the dangers of the positioning of the zebra crossing at the end of Chapel Lane and the state of the footpath in Chapel Lane. A further question was asked about activities for young people in Pinner; many are now taking place at the Heath Robinson Museum. The meeting closed at 10 p.m.